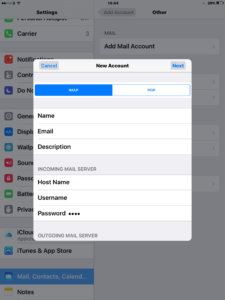 How to create an IMAP Email account on an iPhone / iPad. 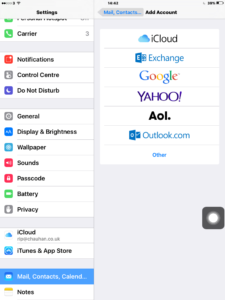 Firstly Go to settings by clicking on the icon that looks like the image below. Then click on mail from that option click add account. 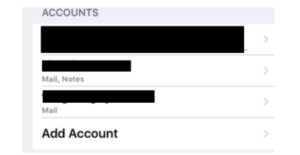 in the image below the user data has been blacked out so this will have your information and as shown below that you can see add account. After clicking add account you now need to click on other. Once you have clicked on mail account enter the name, email, password and click next. 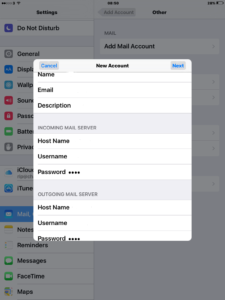 If it does not work click details if a white box appears and click trust then your Emails will load in on the mail icon gradually however if it is a new email Account you should not have anything in there. If you are one of our customers, please contact us for your credentials to set it up.